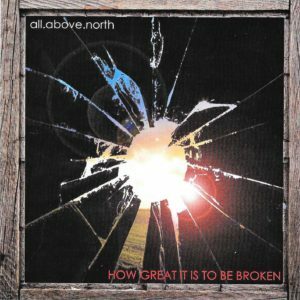 All.Above.North, a Christian indie rock band from Sydney, Australia, have released their new album ‘How Great It Is To Be Broken’. For me personally on first listen, especially on first track ‘Please Don’t Forget Me’,the bands I compared the sound to was The Smiths, U2 and Delirious. The band members might be inspired by those bands over the years, but this guitar band doesn’t just want to sound like those big 80’s and 90’s bands. They want to sound like themselves. ‘Please Don’t Forget Me’ is about being open and honest with God when we face trials and hardship, in the same way that King David was in the Psalms that he wrote. The song is about a faithful crying out to God for help, and having a trust in Him that He will lead us through and not let go of us. And there are a lot of songs about trials and hardship here which adds to the underlying tension on the album. This tension can very much be heard on tracks like ‘Father’ and ‘Your Love Is Unbreakable’. You can feel the hardship and honesty in the songs and as the album continues the sound grows more modern indie rock. Yet what flows through the lyrics is a strong Christian message that isn’t hidden in poetic imagery. This album is full of honest words straight from the songwriters heart into music, not scared to say how they feel. If you’re looking for big dance, pop, worship anthems this is not the place to be. Yet if you are looking for creative, arty music and inspiring and honest lyrics then this is the place to be. Tracks like ‘Walk on Water’ are up there with some of the best songs I have heard in the last few years. Hopefully All Above North will go from strength to strength and keep on making amazing music that will be heard by a wider audience. The early 2000’s was an amazing time for music: rock had evolved into so many denominations and expressions that it collided with pop, hip-hop, country, etc. Furthermore, worship music started to grow and change into a more mainstream sound leading to the explosion of Hillsong, Passion and Crowder, among other progressive pioneers. These incredible trailblazers have led to an ever-growing number of worship artists and bands. Adding to that growing fold is Australian based indie band All Above North with their debut album, How Great It Is to Be Broken. The album is a collection of worship and inspirational songs for the Christian life, however, those lines tend to be blurred as humanity always has an object of affection and worship. Songs like “Your Love” and “Hope” and “Your Love is Unbreakable” reflect on the depravity that is ingrained in the human condition and the separation that it causes between God and His creation. Furthermore, these tracks are balanced out with an honest and heartfelt plea for God to draw the believer closer to himself. While these tracks and others like “Oh What a Day,” “My Desert Heart,” and “Please Don’t Forget Me” sing to the Lord, they are more introspective and not necessarily worship songs, per se. On the contrary, “I Worship You Forever (Psalm 145)” is a pure song of worship and could even be used in gatherings of the church. As lead singer Jon Tiddy sings, “I exalt you God and Father, you’re compassionate, slow to anger, great in faithful love,” he pulls from scripture while utilizing U2 style instrumentation to create a beautiful track. The title track, “How Great It Is to Be Broken,” continues this same style but with a bit more epic arrangement, concluding the album in a solid fashion. Overall, All Above North makes a great effort and has a lot to offer listeners. There are some incredible moments of genius, but with 90% of the songs on the album topping out at over 5 minutes each, listeners may not have the stamina or time to digest the album in its entirety. In addition, musically, the album is very reminiscent of U2 or early works from Coldplay, which may draw or repel listeners, but for this reviewer it is extremely intriguing. As AAN continues to grow and mature in songwriting, we may see some excellent music coming from the band. Make no mistake, How Great It Is to Be Broken is a good album–the instrumentation and production are top notch–it just needs to be honed in a little more to make it a great album. Nevertheless, we should all look forward to seeing the future of All Above North as the band evolves. reminds the listener of God’s victory over even the most broken of us all.